The Mental Health Litigation Division of the Committee for Public Counsel Services is accepting applications for “Regional Coordinators” for the twelve month period from July 1, 2015 to June 30, 2016. Responsibilities include providing advice and technical assistance to assigned counsel in mental health proceedings, reviewing and monitoring the performance of assigned counsel, both informally and through scheduled performance assessments, investigating complaints as to attorney performance, conducting and/or coordinating eight (8) hours of continuing legal education programs for assigned counsel (subject to the approval of the Division), holding regular meetings of panel attorneys, and serving as liaison between assigned counsel or the Division and the local courts. As requested by the Division, Regional Coordinators may be asked to investigate complaints or conduct oversight in another region, if another Regional Coordinator cannot do so, due to a conflict. Regional Coordinators will also assist in the Mental Health Panel recertification process, as requested, including courtroom observation. The Regional Coordinators will be required to participate in regular meetings of Mental Health Litigation Division Regional Coordinators and submit written, narrative, quarterly reports detailing their activities, in addition to billing in the format required by eBill. These are contractual positions and the total hours under each will vary according to location and the number of assigned counsel served. Applicants must possess the following minimum qualifications: membership in the Massachusetts bar; current CPCS Mental Health Litigation certification; extensive trial experience, including a minimum of five years mental health litigation experience; and the ability to maintain good relationships with fellow attorneys and judicial personnel. Due to the changing nature of mental health panel representation, extensive Probate Court guardianship practice on behalf of Respondents and familiarity with Probate Court procedure is preferred. To apply, please send by email a statement of interest, a current resume, a writing sample, and the names of two references by June 9, 2015 to: Karen Owen Talley, Assistant Director at ktalley@publicounsel.net. Please indicate which position you are applying for. This entry was posted in Mental Health on May 27, 2015 by ktalley. BOSTON — On May 11, EOHHS Secretary, Marylou Sudders, announced that Joan Mikula, has been promoted to serve as Commissioner of Mental Health; a position she has held on an interim basis since March. Mikula has worked for the Department since 1985, serving as Deputy and Assistant Commissioner of Child and Adolescent Services. She has prior experience in education, child welfare, criminal justice, and substance abuse treatment and served as Executive Director of a North Shore, non-profit human service agency. As Commissioner of the Department of Mental Health, Mikula will oversee a public operated and private contracted mental health system serving an estimated 23,000 individuals with mental illness and their families. More from Mass.gov. This entry was posted in Children and Family Law, Mental Health, Youth Advocacy on May 25, 2015 by Mark Larsen. This entry was posted in Mental Health on May 22, 2015 by Mark Larsen. 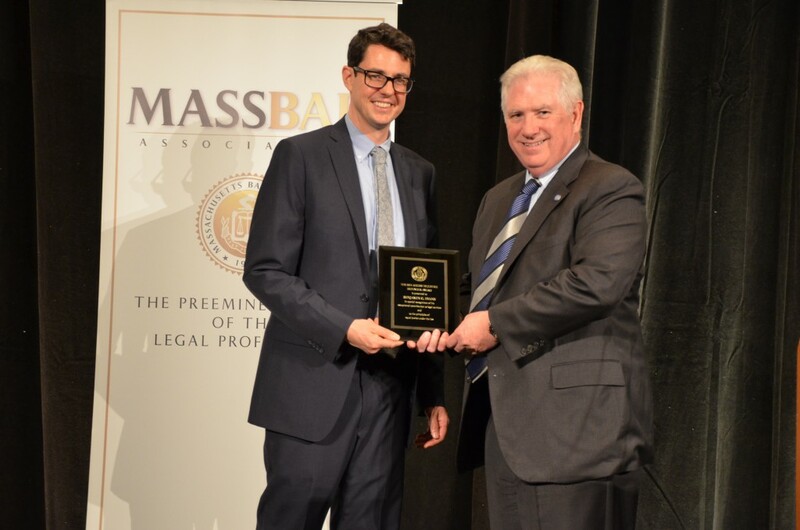 On May 7, 2015, the Massachusetts Bar Association presented Ben Evans, a supervising attorney in the Public Defender Division’s Fall River office with the prestigious Access to Justice Defender Award. After graduating from law school in 2005, Ben started as a staff attorney in the New Bedford office. Ben has been a supervising attorney in the Fall River office since 2011. Ben has been a mentor to many staff attorneys and law school interns. Congratulations to Ben Evans, a public defender who inspires his colleagues to put their hearts and souls into the important work of representing poor people accused of crimes. This entry was posted in Criminal Defense, Public Defender Division on May 22, 2015 by Randy Gioia. The prevalence of mental illness is significant. Well over 50% of state prison and jail inmates report having mental health problems. For women the number is even higher. The report highlights the fact that mentally ill prisoners tend to have higher recidivism rates than those without mental health problems. This is concerning not only because it indicates that people who suffer from mental illness may have trouble establishing a self-sustaining and law-abiding life after release from prison, but also because it has a direct impact on economic and societal costs. On the economic side, these include criminal justice costs (such as those incurred by the police, courts, jails, parole, probation, and prisons). Societal costs include things like victimization and reduced educational or employment opportunities. Read the report. This entry was posted in Criminal Defense, Mental Health on May 21, 2015 by Mark Larsen. The report issued this week, details incidents in which correctional staff have deluged prisoners with painful chemical sprays, shocked them with powerful electric stun weapons, and strapped them for days in restraining chairs or beds. Staff have broken prisoners’ jaws, noses, ribs; left them with lacerations requiring stitches, second-degree burns, deep bruises, and damaged internal organs. In some cases, the force used has led to their death. Read HRW press release and entire report. For a look at a what can happen in Massachusetts, WGBH had a segment about the Joshua Messier case this past week on Greater Boston. The materials for the 2015 Annual Training Conference have been posted on the intranet. To view or download, go the Training Library on the Training Units page and click on “2015 Annual Conference Materials.” A hypertext link of all of the documents will open. To see the materials organized by topic, click on @TABLEOFCONTENTS.htm. A Table of Contents will open with hypertext links to all of the documents. To avoid unnecessary waste, there will not be printed copies of the PowerPoint Presentations at the Conference. (In years past we have thrown out hundreds of copies of unused materials). This entry was posted in Training on May 7, 2015 by dkrupp. PBS News Hour Report: A minority view on hospice and end of life care. This entry was posted in Mental Health on May 7, 2015 by Mark Larsen. This entry was posted in Criminal Defense, Mental Health on May 4, 2015 by Mark Larsen.